By now you might think that Brady P.'s life is all sniffing flowers, throwing rocks and long walks to the beach. 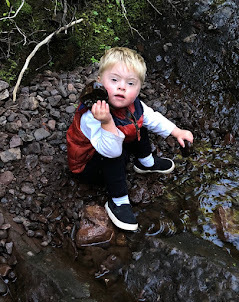 While those serene experiences are a big part of it, he also loves motors and machines. Big and noisy ones. What started as a fascination for the vacuum cleaner has blossomed into an obsession with all Daddy's motorized equipment. If he sees the side-by-side, he wants to go for a buggy ride. 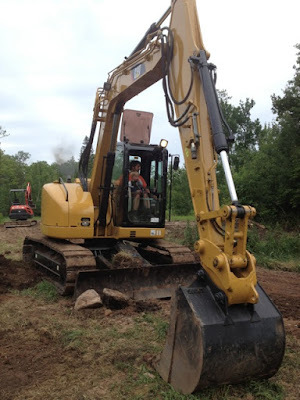 If he's out at the soon-to-open Trails End Campground, he wants to ride on the excavators. All of them. So Daddy Aaron takes him out on the machines. They dig holes, move rocks and uproot trees together. B loves to watch the bucket do its tricks. And Aaron can work it like it's an extension of his body. 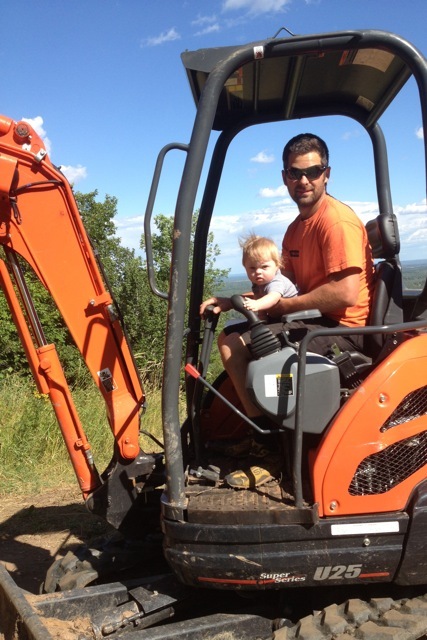 The first time Braeden experienced an excavator from the cockpit, he was nine months old. Aaron was working at Spirit Mountain in Duluth, MN, and Braeden hopped on with him to try it out. As you can see in the picture below, he knew just what to do to take control. Despite the terrible crop job on that shot, you can see Braeden's serious mug... and Lake Superior in the background. Aaron's trail contracting business has grown quite a bit since Brady P. was born, so he has collected an impressive fleet of machines. When Aaron got the big Caterpillar, I just shook my head. I have finally come to terms with the fact that nothing is going to stop that guy from ruling the world. The Cat is Braeden's favorite anyway. Here they are last summer when it arrived at the campground. When motorcycles vroom by, he always stops and points. He waves his little wrist so fiercely that I think his hand might fall off. He does the same for big trucks and ATVs. He's so adamant, that I think one of these days somebody is going to stop and take him for a ride. That's probably what he hopes for. As for our buggy rides, Braeden likes to drive. Aaron buckles his little boy on his lap while Brady P. holds his arms up to "steer." But even more than steering, he likes to toot the horn. This past winter, our family lived in Northwest Arkansas while Aaron built trails there. On our family buggy rides through the valleys, Braeden would toot and toot the horn, making all the cattle look up at us and roll their eyes. They probably huffed, "Darn Yankees," in between bites of grass. 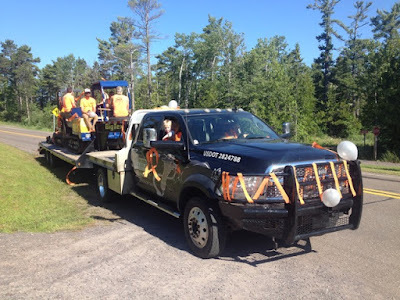 Yesterday, in the spirit of Independence Day, Aaron's Rock Solid Trail Contracting crew loaded up a couple of their machines onto a trailer, and we decorated it as a float in Copper Harbor's Fourth of July parade. Brady P. waved to all his friends from the cab. He even got to help Daddy drive for a little while, so he could wave to his friends on the other side of the road. He handled it really well, as crowds of people are really his thing. Almost as much as driving excavators... and throwing rocks.